Baby wipe tie dye is a quick and easy art and science project that’s safe for kids. While the product resembles 1970’s art, the pattern is pure science. Here’s what you do and an explanation of how it relates to scientific principles. Baby wipes are dampened with water and glycerin and sometimes alcohol. If you don’t happen to have any baby wipes, you can substitute paper towels or coffee filters for this project. If you’re using paper towels or coffee filters, get them damp (not wet) with either water or else bubble solution (closer in composition to what’s in the wipes). If you don’t have rubber bands, use any kind of tie… strings, hair elastics, etc. The project works best with water-soluble liquid pigments, so markers, highlighters, and watercolors are great. Unless the wipes contain alcohol, it does not work with permanent ink (e.g., Sharpie pens). If you only have permanent ink pens, you can either use liquid food coloring instead of pens or watercolors or you can use the permanent markers so long as you dampen the wipes with rubbing alcohol first. It’s up to you. Experiment! Let’s Make Baby Wipe Tie Dye Art! Twist the wipe tightly. For the circular design like in my picture, I first folded the wipe into quarters and then twisted. Use rubber bands (or whatever you’re using) to hold the twist in place. Leave some space between the bands because that’s where the color goes. Where the bands are is where the color won’t be (at least, not as much, but more about that later). Color in the space between the bands. You should see the colors start to run. If they do not, you can add more color or drip a few droplets of water onto the ink until it starts to bleed. You don’t need to completely color in the space because the colors will run. That’s the point, after all. Now, you have a choice. 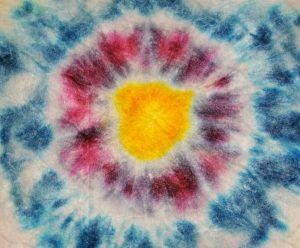 You can either set your creation aside to dry and then remove the bands or you can remove them now and then let the tie dye dry. It’s up to you. I removed the bands when the wipe was still damp. While this did get dye all over my fingers, it also permitted the colors to run into the open space a bit. If you want well-defined edges, don’t unwrap the bands until the paper is dry. If you want the colors to run, possibly into each other, remove the bands when the paper is damp. Enjoy your art! If your wipes are scented, it not only looks cool, but smells nice, too. Water and humidity will make the colors bleed, but you can seal the paper with hairspray if you want the design to last longer. You’ve got a few scientific principle here. First, this project can teach how colors blend together to form new colors. For example, a blue band and a yellow band will form green where they meet. The project also illustrates transport. The damp ink will diffuse from areas of higher concentration to those of lower concentration. However, most of the time you get a kind of paper chromatography, where some of the pigments in the ink are larger than others, so the color separates into its components. I took the photo of my “art” while the wipe was still damp and the process was still occurring, but after time, my purple color bled into rings of red and blue. My blue turned out to consist of both green and blue. The smaller molecules move through the wipe material more easily than larger molecules, so you get a nice separation. If you drip more water onto the wipe, the transport process will continue. If you want more permanent artwork (like you can use on t-shirts and wash), try my Sharpie tie dye project.